At the end of the day, you have the most to gain and the most to lose from this decision. Warning: This may contain some spoilers from the movie Dead Poet’s Society. If you care that much (even though the movie is nearly 30 years old), read no further. 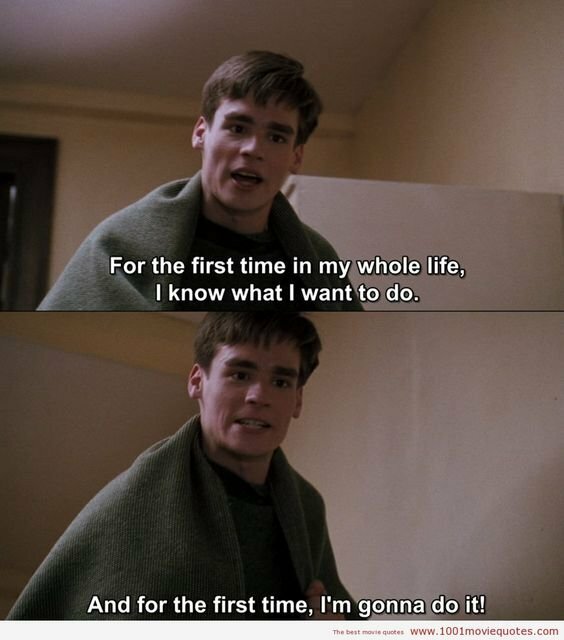 My first time watching Dead Poet’s society, I remember crying. Crying hard. Ever since I first heard of it, I’ve always wanted to watch it. But I’m glad I didn’t until my first semester in college. If I had watched it any earlier or any later, It would have meant absolutely nothing to me. Coming into college, I was a nursing major knowing full well that it was not what I wanted to do. But alas, the sway of my Carribean parents who just wanted me to have a stable and guaranteed future and their money that would help pay for my education was very strong. So, I entered college in the nursing program and trudged my way through every torturous class (very convinced that chemistry is actually where lost souls go to die). English and writing were always my passions and when I dreamed of the future, they are what I saw myself in. So even enduring one semester of the classes I was in crushed me thoroughly. Not only was I suffering academically, but internally also. I had no motivation for anything. I found it nearly impossible to even want to get out of bed and sometimes, to wake up at all. Halfway through my first semester I, like Neil in the movie, decided I’d rather die than not pursue my passion (though a little less literally). After months of phone fighting back and forth with my parents, they finally gave up. I saw where they were coming from in wanting me to have a stable future, but I just couldn’t bring myself to agree with them. Our obsession with material things as a society is overwhelming. We let objects (specifically, money) rule us and still convince ourselves into thinking that we are the ones in control. Though it would be very nice to have a six-figure income, I truly believe that no salary is worth more than your well-being and your happiness. If I had to advise anyone on what to do, I would choose passion. Every. Single. Time. As a college student, you are faced very harshly with the reality of what's to come. In high school, everything seems so far away. As soon as you get to college, It’s like time starts going a little faster. One of the most formative times in your life in which you get to explore yourself and how you interact with those around you feels like it only lasts for a couple of seconds. In those few seconds, you come to realize that some things are non-negotiable. Maybe it’s the Virgo bursting out of me, but I can’t imagine you are truly living life if you are not living it with passion. I don’t know exactly what I want to do with this degree I’m pursuing and that’s OK.
Not knowing was the main reason I let myself be pressured into choosing the way I did in the beginning. I was so afraid of the uncertainty that I figured going into college with a set path (albeit a wrong one) was better than no path or an uncertain one. But, I found my certainty in taking a chance on the uncertain and fighting for it. Now I am where I’m supposed to be at this specific moment in my life. I may not have a roadmap but I have goals and passion. Those are, I believe, are crucial to being successful in whatever you do.